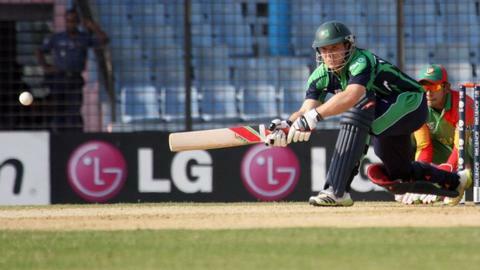 Ireland completed their World Twenty20 preparations with a six-wicket defeat by Zimbabwe in Dharamsala on Saturday. The Irish posted a modest total of 155-8, with Gary Wilson (38) and William Porterfield (31) the main contributors. Hamilton Masakadza hit six sixes in his 68 which set Zimbabwe on their way to victory, with 160-4 in 17.5 overs. Ireland start their World T20 Group A campaign in Dharamsala on Wednesday against Oman followed by encounters with Bangladesh and the Netherlands. The winners progress to Group 2 in the Super 10 stage and games against hosts India, Australia, New Zealand and Pakistan. Ireland eased to a 10-wicket victory over Hong Kong in their opening warm-up match in Dharamsala on Thursday.